A team led by astronomer Scott Sheppard from Carnegie University found the planet with the Subaru Telescope on Mauna Kea, Hawaii. The Goblin has a highly-elongated orbit that takes it as far as 2300 AUs from the Sun. It doesn’t interact gravitationally with the other planets in our Solar System, but is bound to the Sun. It’s part of a cluster of Extreme Trans-Neptunal Objects (ETNOs) that together point to the existence of Planet 9. “These distant objects are like breadcrumbs leading us to Planet X.” Scott Sheppard, Carnegie University. The Goblin got its name because it was discovered at Halloween. It’s one of a group of objects that are also called Inner Oort Cloud Objects (IOCOs). 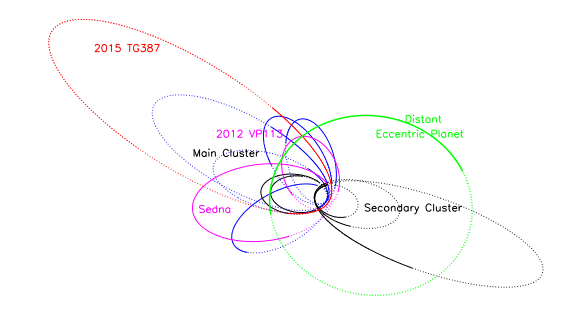 The group includes 2012 VP113, and Sedna. There are probably many more of these objects out there, but they’re hard to detect because of their distance. Sheppard, and many other astronomers, think that these objects’ highly-elongated orbit is shaped by the so-far undetected Planet 9. Planet 9 would have to be large to shepherd the IOCOs, so discovering it is one of astronomy’s holy grails. Dwarf planet 2015 TG387, or Goblin, has an orbit that takes it much further from the Sun than other Inner Oort Cloud Objects Sedna and 2012 VP113. Image: Roberto Molar Candanosa and Scott Sheppard, courtesy of Carnegie Institution for Science. Sheppard and one of his colleagues on this study, David Tholen from the University of Hawaii, were also behind the discovery of 2012 VP113, another IOCO. They announced that discovery in 2014. 2012 VP113 has the most distant orbit at perihelion, at just over 80 AUs. After that discovery they noticed similarities in the orbits of several extremely distant Solar System objects. That similarity led them to propose the existence of a planet several times larger than Earth. The supposed planet has been dubbed ‘Planet 9’ or ‘Planet X’, and its orbit would be hundreds of AUs from the Sun. “We think there could be thousands of small bodies like 2015 TG387 out on the Solar System’s fringes.” – David Tholen, University of Hawaii. It took a long time to discover and confirm the existence of the Goblin. Several years passed before they could confirm its existence because it has such a long orbital period and moves so slowly. They first observed it in 2015 with the Subaru Telescope. Follow up observations in 2016, 2017, and 2018 using the Magellan telescope at Carnegie’s Las Campanas Observatory in Chile and the Discovery Channel Telescope in Arizona eventually confirmed the planet’s existence. The Goblin’s diameter is only 300 km, putting it on the small end of being a dwarf planet. “They can be used as probes to understand what is happening at the edge of our Solar System.” – Scott Sheppard, Carnegie University. The location of the Goblin’s perihelion is similar to the perihelion’s of Sedna, 2012 VP113, and other extremely distant Trans-Neptunal Objects. This is strong evidence that something is pushing them into similar orbits. That’s where Planet X comes into the picture. Nathan Kaib of Trujillo University in Peru, and the University of Oklahoma, ran computer simulations to determine the cause of the TNOs. They simulated different hypothetical Planet 9 orbits to see how they would affect the Goblin’s orbit. Most simulations showed that the Goblin’s orbit would have been stable for the age of the Solar System. They also showed that Planet 9 would shepherd 2015 TG387’s through space, keeping its distance from Planet 9. This could explain why the other extremely distant objects in the Solar System have similar orbits, without ever coming close to Planet 9. The relationship between the Goblin and Planet 9 would be similar to the relationship between Pluto and the much-larger Neptune. Though their orbits cross, the two never get close to each other.